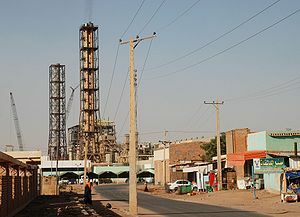 Khartoum North or Bahri (Arabic: الخرطوم بحري‎, al-Kharṭūm Baḥrī) is a neighborhood in the northern region of Khartoum, the capital of the Republic of Sudan. It is located on the north bank of the Blue Nile and east bank of River Nile near its confluence with the White and bridges connect it with Khartoum to its south and Omdurman to its west. It is thought to have a population of over a million, but the last Sudanese census occurred in 1993 when its population was only 900,000. On August 20, 1998 the Al-Shifa pharmaceutical factory was destroyed by a cruise missile because the United States accused the factory of making VX (nerve agent) for al-Qaeda. The industrial centre of the region and the country, the neighborhood contains dockyards, marine and rail workshops, and sawmills. Khartoum North trades in cotton, grains, fruit, and livestock; industries include tanning, brewing, brickmaking, textile weaving, and food processing. Since the year 2000, chemical plants supplying household products to the rest of the country have been built in the neighborhood . A wealthy suburb is growing towards the eastern part of the neighborhood , along the Blue Nile. Chisholm, Hugh, ed. (1911). "Khartum" . Encyclopædia Britannica. 15 (11th ed.). Cambridge University Press. p. 773. ^ Astill, James (October 2, 2001). "Strike one". London: The Guardian. ^ "US Destruction of Al Shifa Factory 14th Anniversary". Sudanese embassy in Washington, DC. Archived from the original on 2013-01-17. ^ Peterson, Scott. "Sudanese factory destroyed by US now a shrine". Christian Science Monitor.